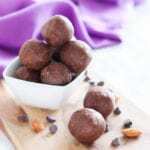 Coffee lovers, these Almond Mocha Chip Protein Bites are for you! Packed with antioxidants from raw cacao and naturally sweetened with maple syrup, they’re a snack that taste decadent but are actually healthy! See recipe notes for a grain-free paleo option. Pulse the almonds in a food processor until they form a coarse flour. Add the almond flour, oats, cacao powder, ground coffee, protein powder and maca. Whirl again until the oats are broken down into tiny pieces and the mixture is well-combined. Add all remaining ingredients except dark chocolate chips to the processor and continue processing until the mixture resembles a dough. Add a little water as needed to moisten, or a little extra almond flour if it’s too sticky. Pour the dough into a bowl and add the chocolate chips. Knead the dough one last time with your hands, then roll it into 10-12 small balls. Store leftovers sealed in a container in the fridge or freezer. *If you prefer your bites to have a smoother texture, you can swap the raw almonds for another 1/3 cup of almond flour. I like mine to be a little crunchy, hence the almond + almond flour combo. If you prefer the recipe to be 100% grain free, you could also do the same for the oat flour and just adjust with a little extra water if the mixture seems to be too dry.